Since the July 24 issue is all about summer reads, we thought it would be fun to share what Kitchissippi Times staff and contributors have on their reading lists as well. We’d love to hear what’s on your list too. 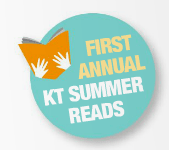 Send an email with your top summer book picks to editor@kitchissippi.com and you may see them listed in a future issue or online at Kitchissippi.com. I’m reading Buyology: Truth and Lies About Why We Buy, by Martin Lindstrom. So far it’s been a fascinating look at what moves people to buy things and choose one product over another. It’s more than just advertising and promotion; our desires are buried deeply in our subconscious mind. I’m just on the last few pages of The Orenda, by Joseph Boyden. It’s an exceptional novel that combines early Canadian history with fantastic storytelling. Though it’s on the lengthier side, I’ve been reading through it quickly. It’s easy to become engrossed in the story and lose track of time. It’s time to get a fresh start on my reading. Lately, I’ve mostly been reading newspapers and magazines. This summer I picked up Fight Club by Chuck Palahniuk and the full Lord of the Rings trilogy — the latter of which should be more than enough of a challenge on its own. I’m reading Punishment in Disguise by Kelly Hannah-Moffat about the imprisonment of women in Canadian federal jails. It’s in preparation for going back to school this fall to do a PhD in criminal justice. On a lighter note, I’m also reading La plaisanterie by the incredible Czech author, Milan Kundera. I am reading What to Listen for in Mozart, by Robert Harris. This book gives amazing and fascinating insight into the personal life and character of the world’s most beloved composers, and introduces the reader to the hidden pleasures of classical music and Mozart’s greatest masterpieces. I’ve finally started Kazuo Ishiguro’s Never Let Me Go. He’s a favourite author of mine, a true master of subtlety and characterization, and I’m excited to see how his themes develop in a setting tinged with a few elements of science fiction. I’m reading Bill Bryson’s One Summer: America 1927. It’s an immensely readable, non-fiction romp through a pivotal summer that includes the escapades of Babe Ruth, Charles Lindbergh, Al Capone and a host of other characters who had a profound impact on their times and beyond. Right now I’m reading MadAddam by Margaret Atwood. It’s the third book in a trilogy. It’s one of those post-apocalyptic, dystopian sort of stories. Being an Atwood book, it is quite bleak, but the writing is some of the best she has ever done and she pulls you into the world she’s created and makes it feel very real. I’m reading What To Expect When You’re Expecting, by Heidi Murkoff and Sharon Mazel. For any first-time moms, it has been a fantastic resource and answers practically every pregnancy-related question you might have. In addition to offering very useful advice, it certainly puts any soon-to-be mom’s mind at ease. I’m reading Wolf Hall by Hilary Mantel, a British writer. Set in England in the 1520s, the book weaves the history of England in the throne years of Henry VIII and his quest to annul his marriage of 20 years and marry Anne Boleyn. The effect on Cardinal Wolsey’s career, rise of Thomas Cromwell to fill the gap in power and how Cromwell proceeds to reshape England is well researched and vividly portrayed. I am reading Memories of the Old Plantation Home, by Laura Locoul Gore. I picked it up during a tour of Laura’s Plantation outside of New Orleans, where I was visiting my daughter this summer. It is the true story of the Duparc-Locoul family’s four generations of building and running a sugar cane plantation. The matriarch’s parents were from Montreal, where I was born. It provides insight into the life of plantation owners and slaves under the French civil code that was so different than elsewhere in the U.S.
I’m re-reading Martin Luther King, JR. on Leadership by Donald T. Phillips (lying on the beach under a tree, sigh). It provides great inspiration particularly if you feel like you’re being lulled into mediocrity by the challenges or circumstances of your life. It has been several years since I first read the book so I’m gleaning new information but the overriding theme remains the same, NEVER GIVE UP! Apart from my son’s LEGO instruction books, I’m reading 56: Joe DiMaggio and the Last Magic Number in Sports by Kostya Kennedy. Taking me back to the summer of 1941, the meticulous and fascinating book not only chronicles DiMaggio’s unbreakable hitting streak but the final months before America entered the Second World War. I am currently re-reading The Paris Wife by Paula McLain (which is a must if you’ve seen Woody Allen’s Midnight in Paris) and like to shift my attention to British magazines Living Etc and Jamie in search of inspiration for design, decor and good eats! I’m reading The Kind Mama by Alicia Silverstone, not because I subscribe to the opinions/theories of this woman/mother/actress, but because I aim to keep an open mind to various methods in which children are raised nowadays. Some of the information I find to be useful and practical while some is completely out of touch with my own reality. Overall a good surprisingly non-preachy read for any mother looking for information. Plus it’s a nice break from reading all those baby furniture assembly instruction manuals!! I’ve been on a biography run for a while and I’m currently enjoying Total Recall, the Arnold Schwarzenegger story. The first section covering his early years is a fascinating look at life in post WW2 Austria. From there, it’s a truth is stranger than fiction tale that follows Arnold’s success from bodybuilder to box office superstar, to governor. Lots of chuckles as Arnold shares his amazing life story.